A crying dog will cry when he is lonely, insecure or anxious. Puppies cry or whine their first few nights you bring them home as this is the first time they are away from their mother and littermates. When your puppy is left alone he will whine or cry for attention; he needs to know you're close by and haven't forgotten him. Teach a crying dog it is okay, and not scary, to be alone. Put him in his crate with some toys, a blanket and one treat. Say "crate" so he knows what it is. If he cries, let him. Make sure he can see you, though. He'll start to feel comfortable alone in his crate, but it may take a little time. Each day, increase the time he is in his crate by 5 minutes until you've worked up to him staying in his crate for at least 30 minutes without your dog crying. Once he's not crying or whining in his crate, start over again. This time leave the room. Start with 5 minutes the first day and increase it 5 minutes every day or two until he can stay peacefully in his crate with you out of the room. Try leaving a radio or tv on low if you have to leave him alone during the day if you work or run errands. Soon, when you say "crate" your pup will go in the crate on his own and you won't have a crying dog anymore. Puppies will nip you. Holly did. They have very sharp teeth and it hurts! To correct this, say "ouch!" and stop playing with her. She'll learn to stop nipping. You can also say "No!" and hand him his chew toy. 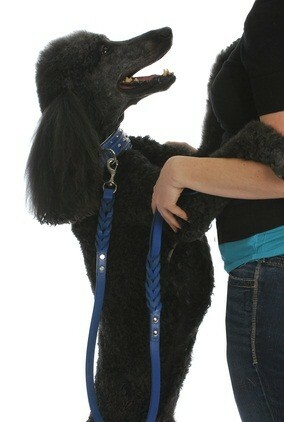 To stop your standard poodle from jumping on people, ignore it when she starts doing it as a puppy. For an adult standard who starts to jump, turn to the side and ignore him. When he gets down, tell him to sit and then praise him. If your dog is aggressive or has behaviors that are driving you crazy or are harmful to your pet or your family, there are dog behaviorists who can help you get to the root of the problem and correct it. To find a behaviorist, contact the Animal Behavior Society or the International Association of Animal Behavior Consultants. The behaviorist will give your poodle one on one attention in your home so he can figure out why your dog is doing a certain behavior (the cause) and how this behavior can be modified or corrected. This is like us humans going to a psychologist or psychiatrist. Bad dog behavior can be changed with patience, love and consistent training. 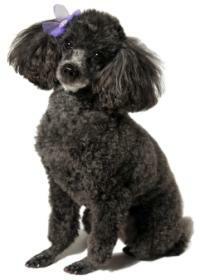 Your poodle wants to make you happy and will quickly learn to stop the adverse behaviors.